With a distant eye on retrieving the marathon world record this coming Autumn, Wilson Kipsang takes a chance of getting beaten by one of his training partners again, when he races the Mattoni České Budějovice Half-Marathon in the Czech Republic tomorrow evening, Saturday June 3. The race is one of the RunCzech series of seven annual events; and in another of their promotions three years ago, Kipsang was upstaged in the Olomouc ‘half’ by his unknown colleague, Geoffrey Ronoh. Even worse, it was Kipsang, then the marathon world record holder, who suggested his training partner Ronoh have his first race outside Kenya…. as Kipsang’s pacemaker. You can guess the rest; the pair ran together until 18k when Kipsang realised that Ronoh was in better shape than even he had thought. He gestured Ronoh forward, and the acolyte duly beat the master by eight seconds with both just over the one hour mark. But both Kipsang and Ronoh have gone under the benchmark ‘hour’ of the elite half-marathoner, Kipsang with 58.59, and Ronoh with 59.45. 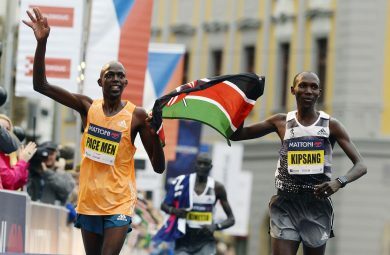 Yet, says Kipsang, “Geoffrey is a better half-marathoner than me. I’m more of a marathoner”. Ronoh is an intriguing character. Half a dozen years ago, just short of his 30th birthday, he was working as a park ranger in his home province of Kericho, Kenya’s tea country. Fascinated by Kenyan running success – “I’d watch all the running I could on television, Olympic Games, world championships” – he got a transfer to Iten, training home of Kipsang and many other elite groups. And started training. “I still work as a ranger, sometimes at nights, but they give me time off for training and races”. He hasn’t quite cut it as a marathoner yet; his best in five attempts is 2.09.26 for sixth place in Berlin last year. But, says the now 34 year old ominously, “it’s just a matter of time”. Speaking of Berlin, that is where Kipsang set his world marathon record, of 2.03.23 in 2013. He ran ten seconds faster in Berlin last year, but still managed to lose by ten seconds to Kenenisa Bekele, who was half a dozen seconds shy of Dennis Kimetto’s 2.02.57, set (inevitably) in Berlin 2014. Kipsang plans to go back to the Berlin racetrack on September 24, with a view to going even faster. “I’m just waiting for confirmation on Berlin from my management, and then I can go back to Kenya, and concentrate on training. No more racing before then. I want to get my world record back”. České Budějovice tomorrow evening will be the springboard to that assault on Berlin.  TheRunCzech organisation is already on a ‘high’ this week, with the ratification of Joyciline Jepkosgei’s feat, running a world record of 64mins 52sec in the Prague Half-Marathon, and also breaking world records for 10, 15 and 20k en route. The Mattoni České Budějovice Half-Marathon will be streamed online Saturday evening, at 16.30gmt, on www.RunCzech.com.